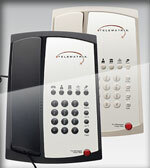 Telephone Magic has been a leading supplier of hotel phone sets since 1989. As such, we will not knowingly be undersold. There's a reason we're among TeleMatrix's top distributors and you owe it to your business to try us today. When it comes to selling hotel telephone sets, Telephone Magic is the best name in the business! TeleMatrix Marquis 3100 Series is sleek with modern European styling and consistently reliable, durable and inventive products. Marquis 3100 Series telephones are available in a variety of single and 2-line models to meet your requirements, or to replace existing installed telephones. An excellent combination of style and economy, the all new 3100 basic phone features high quality construction, contemporary sweeping design, a full range of configuration options and comes ready for desk use in Ash and Black. Includes SteelTrap® memory technology (no batteries required), and a 5-Year ‘no hassle’ warranty. Wall mount available. With almost 25 years experience and millions of telephones installed worldwide, TeleMatrix has market proven manufacturing, testing and pre/post service techniques. Constantly looking from the telephone’s eye-view we have pioneered most of today’s hospitality end-point communication innovations. The Marquis 3100 LBY is our single-line lobby phone with Direct Dial Down programming control is designed for convenient guest communication throughout your property. 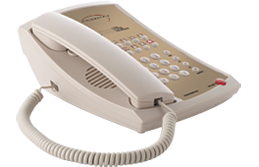 The Marquis 3100 MWB hotel phone is our basic single-line feature phone without programmable speed dial keys at a budget-oriented guest room phone price. The Marquis 3100 MW5 hotel room phone is one of the most popular choices in a single-line feature telephone, with 5 programmable speed dial keys to help raise your room revenue. The Marquis 3100 MW10 is a single-line feature phone with 10 programmable speed dial keys to help reduce front desk call traffic. The Marquis 3100 MWD5 is a single-line speakerphone with 5 programmable speed dial keys for complete speed dial capabilities. The Marquis 3100 MWD is a single-line speakerphone with 10 programmable speed dial keys. This is our most popular single-line speakerphone. The Marquis 3102 MWS is a value-priced, two-line speakerphone for convenient hands-free communications. The Marquis 3102 MWD5 is a two-line speakerphone with 5 programmable speed dial keys - your guests will enjoy the full hands-free convenience! The Marquis 3102 MWD is a two-line speakerphone with 10 programmable speed dial keys for your most valued guests. The Marquis 3100 Series wall mount bracket allows you to wall mount any of the Marquis 3100 series phones to save desk space or for phones located in areas without a desk, such as a lobby area. The kit includes everything required to convert a desk phone to a wall mounted telephone.